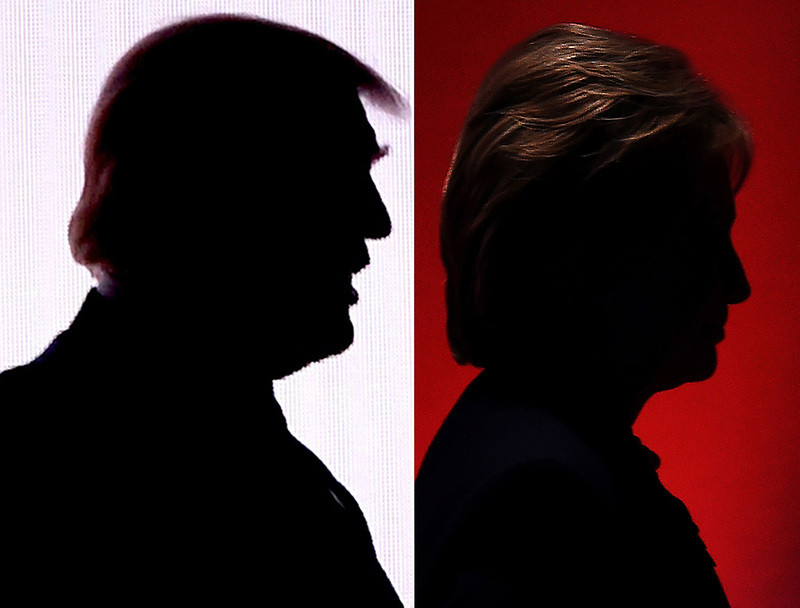 A combination of file photos of the silhouettes of presidential nominees Donald Trump and Hillary Clinton. There are so many Hillary haters in China! I can understand many Chinese are worried about Hillary’s hawkishness, and are afraid that her China policy might contain China’s future development. But what I can’t stand is that many people use mean and discriminatory language toward her. They called her an “old witch” and joked that she couldn’t please her husband, which led to Bill Clinton’s affairs. So many Chinese have illusions about Donald Trump. I studied at one of China’s top-five universities as an undergraduate. I still remember students talking about The Apprentice, sharing what they learned from each episode and expressing their admiration for Trump. For many Chinese, especially the young generation, this reality TV show was how they got to know Trump: as a powerful and smart businessman. When I have criticized his controversial comments in the podcast or in my articles, some of my audience has fought back saying that Trump was just acting, that he was much smarter than the image he created, he was just using soundbites to get free air time. I even overheard some very prominent Chinese business executives say “Trump is a businessman and he will be willing to do business with China so China can benefit from the negotiation.” Trump might be smart, but demagogues should not be viewed as right and be praised. China’s language barrier and the information gap helped our closed social media platform become a hotbed for conspiracy and rumor. When Hillary “collapsed” at the 9/11 anniversary event, several Chinese WeChat accounts translated articles that said Hillary would die in one year, and used eye-popping headlines as clickbait. Many of my friends sent the articles to me and asked whether the news was true. WeChat and Weibo help people to voice their opinion—every single person can be a news creator, but without fact checking, without an understanding of America’s polarizing media industry, Chinese social media users sometimes help rumors and inaccurate news spread. This is especially true in WeChat, which operates as a closed ecosystem in which users only directly communicate with their own friends. Making users reliant only on their friends for information sometimes makes it hard to get to verified primary sources. I got chances to go to rallies, and covered the Democratic National Convention (DNC) in Philadelphia. I heard the frustration and anger from many ordinary people. At the DNC, Bernie’s emotional and powerful speech made me tear up. When Hillary accepted the nomination and made history, the emotions in the stadium overwhelmed me too. Currently, the world is in the midst of two important presidential elections. The first is between Hillary Clinton and Donald Trump. The second presidential election encompasses the entire world: an election between China and the United States, the world’s two most powerful countries. Just like a country needs a president, the world also needs a president. The American presidential election is once every four years, but the global presidential election is once every 100 years. This current election is a contest of the century—and one whose outcome we won’t be able to see for another 30 years. But I can state confidently that America is not suited to be the world’s president of the 21st century. And that’s because in the 21st century, the problems it creates for the world are far greater than the problems it solves for the world. America has become a problem for the world, a creator of trouble for the planet. America’s problem is not only that it’s a declining hegemon. It also suffers from a poverty of strategic wisdom, and a lack of greatness in its people. The American election now could not produce a George Washington, a Franklin Delano Roosevelt, or even a Richard M. Nixon. The American democracy of today cannot produce great people, or great heroes. This is the tragedy of American democracy. Whether Trump or Hillary becomes president, America is facing what I call the “three impossibles.” It’s impossible to fundamentally change America, Sino-U.S. relations, or the face of the world. Today, if Americans want revolution, they can’t produce a Mao Zedong; if they want reform, they can’t produce Deng Xiaoping; and if they want innovation, they can’t produce a Xi Jinping. Therefore, I’m not paying much attention to this election: I don’t trust or believe in this American democracy election game. Nowadays, among the world’s leaders, the most charming, the most enchanting, is Xi Jinping. He’s the number one leader on the international stage. In the competition between the United States and China in the fields of reform, innovation, and development, a President Trump cannot defeat Xi—and nor could a President Hillary. China is now emerging into the graceful position of the world’s leading country. In the world’s campaign for the president of the 21st century, China must win. The American presidential election is a big game, with American characteristics. America’s great democracy is a performance. Its selection of its president is more like choosing an actor. When Chinese people watch America’ election, it’s like they’re at the theater, watching traditional opera. Each four years, the presidential election is like a Hollywood political blockbuster—to satisfy American’s need to watch politics. I agree with Qiaoyi that the popular Chinese opinions towards Trump and Hillary are strongly influenced by their information sources. Many English-language news sites are blocked in China, and mainstream Chinese media outlets with extensive coverage of international affairs, like Global Times, are hotbeds for nationalistic views. On the other hand, this is the third American election the Chinese have watched since the arrival of social media about a decade ago. Tidbits of American commentaries on the campaign regularly appear in Chinese discussions on Weibo and Weixin, and the election debates also can be streamed in China for a growing number of web users with VPN access. Chinese who have been following American elections over the years are also becoming well-versed in hot-button issues such as gay rights, immigration laws, and tax reform. Although rumors still have their currency, with the blow-by-blow social media coverage of the campaign, they seem to get debunked more quickly than in previous election cycles. Other shocks to lay Chinese observers of American politics include, for instance, rumors of Clinton’s poor physical health and Trump’s apparent proposal that China should invade North Korea. To Chinese, once again the American presidential election looks like a political game. The two candidates are talking about a few things they are unlikely to do. Donald Trump has promised to build a wall along the U.S.-Mexico border to prevent illegal immigrants from entering America. However, he knows that Congress is unlikely to fund his wall if he is elected. Nevertheless, by saying he’ll build a wall he could possibly secure the support of those Americans who are concerned about losing jobs due to the presence of such immigrants. Hillary Clinton knows that the U.S. has no money to do what she suggested to Barack Obama: a U.S. pivot to Asia. Pivoting costs money, and bringing 60 percent of the U.S. Navy and Air Force to Asia would not leave enough GIs in Europe and the Middle East to deal with ISIS and a seemingly assertive Russia. To manage security challenges looming large in Asia, the Middle East, and Europe at the same time, the U.S. has to increase and modernize its military at a level that would cost money that the U.S. doesn’t have, especially at a time when the national debt has reached U.S.$18 trillion. Despite not believing their own campaign rhetoric, the leading candidates still voice their views to draw their constituents’ votes. Such contradictory behavior is predictable in a veteran politician like Hillary Clinton, but it is interesting to see that Donald Trump is behaving similarly, fast training himself to be a politician, too. Given their behavior, it’s important not to take too seriously the campaign rhetoric they voiced during their first televised debate. Indeed, Trump has threatened to sanction China for what he sees as Beijing’s unfair trade and currency practices. Let’s not forget that many previous U.S. presidential candidates made similar threats but none of them ever followed through. Only President Bill Clinton pretended to be serious about linking China’s Most Favored Nation (MFN) trade status with Beijing’s human rights record, but he quickly abandoned this idea as infeasible. Bill Clinton decided to delink MFN and human rights without abandoning his commitment to promoting the importance of human rights. With China’s rapid rise in importing U.S. goods and services, investing in America and sending millions of high-spending tourists to the U.S., any high-handed action by America on the issue of trade would be a virtual suicide. China may feel surprisingly pleased that both Donald Trump and Hillary Clinton are uninterested in the Trans-Pacific Partnership (TPP), at least in its present form. Beijing understands that as an important component of the Asia Pacific rebalancing, the TPP is geared to counter China’s competence at exports. As the U.S. Congress currently is controlled by the Republican party in both chambers, the TPP is unlikely to see the start of the ratifying process before Obama leaves office. Because both Trump and Clinton feel that the TPP won’t bring enough jobs home, they have to kill it or revise it, a move that could upset other member states who already have signed the treaty. The good news is that through China’s efforts at cutting manufacturing overcapacity, coupled with its campaign of innovation, Beijing is more or less prepared for the TPP these days. Eventually, China may be better prepared for a freer trade regime through boosting its innovation, efficiency, market access, and environmental protection. On another note, Trump may find lots of Chinese sympathetic to his position against illegal immigrants. Even as a developing country, China has helped finance international efforts to save millions of refugees, for the sake of its social stability. It looks that Obama’s refugee policy is similar to China’s and that Hillary Clinton would be likely to carry on such policy were she elected.